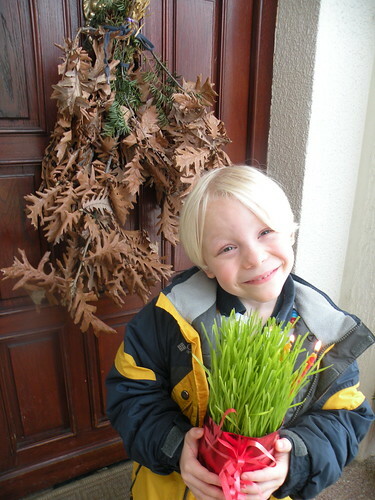 Oliver is pictured above with the “badnjak” and the “žito” they were sell at our local market yesterday. They are both Serbian Christmas traditions. I blogged about the Christmas Eve tradition of the badnjak last year. We hope again to burn the badnjak (tied to our door) with a church on Wednesday night, Christmas Eve. Thursday, January 7th is the Serbian Orthodox Christmas. Can any of the readers give me background on the žito? The word means “grain” in Serbian. They were selling them in the market. It is a type of live grass. The one I bought is growing in the bottom of a 2-liter bottle. All had a candle put in and a Christmas wrapping. I think it must be something to do with the winter solstice and thanking the sun for its return and wishes for a good growing season and harvest in the upcoming summer. We had a fire yesterday to roast peppers and egg plant. Nadia made a humus-like paste, I forget the name, with the egg plant. It was a cold day and see the comfort a family fire hearth would give to the ancient Slavic tribes. I could also see where they would be thankful that the days were getting longer. Thankfully with modern heating and electricity, we don’t have to worry about that anymore. I think it is good however, to pay homage to our ancestors and the tough life they lived. We are enjoying the week in Belgrade before we have to go back to school next Monday. We are pictured below in our trusty Edelweiss at our last gasoline stop for the road trip. We drove through snow and ice on Sunday evening to return home. 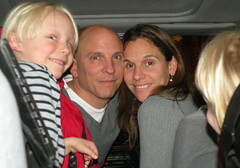 Traveling with young children is taxing and the kids were very happy to be home after a week on the road. The seeds are planted in a bowl Dec. 19, St. Nicholas Day, and watered after a recitation of the Lord’s Prayer. Waiting for them to grow is a spiritual exercise. “Isn’t it a fun way to pass the short, dark days waiting for the birth of Christ?” said Ms. Bizic, who retired five years ago as a librarian in the Quaker Valley School District. The green wheat is held tall and straight by a circlet of ribbon in the Serbian national colors of red, blue and white. “When you first put the wheat in, you wonder if it will grow. But then you see it put out these little knots, and then the shoots. You can see it grow the next day and the next. It fills you with happiness,” she said. I think this article will give you some insights into Serbian Orthodox Christmas.